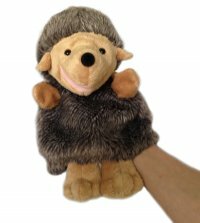 NIC NAC 14" (35.56cm) high quality, plush Hedge Hog Full Body Hand Puppet - Curtain Critters Inc.
HEAD AND ARMS CAN MOVE: Not only can you make the head and arms move, but because it's a full body puppet, you can make him sit and run, etc.! Kids will think he's a real Hedge Hog! EASY TO USE: This adorable hand puppet is easy to use! Just insert your hand up through the bottom of the puppet and put your index, middle and ring fingers into the opening for the head to make the head move. To move the arms, just insert your thumb into the opening for the left arm and your pinky finger into the opening for the right arm and that's it!